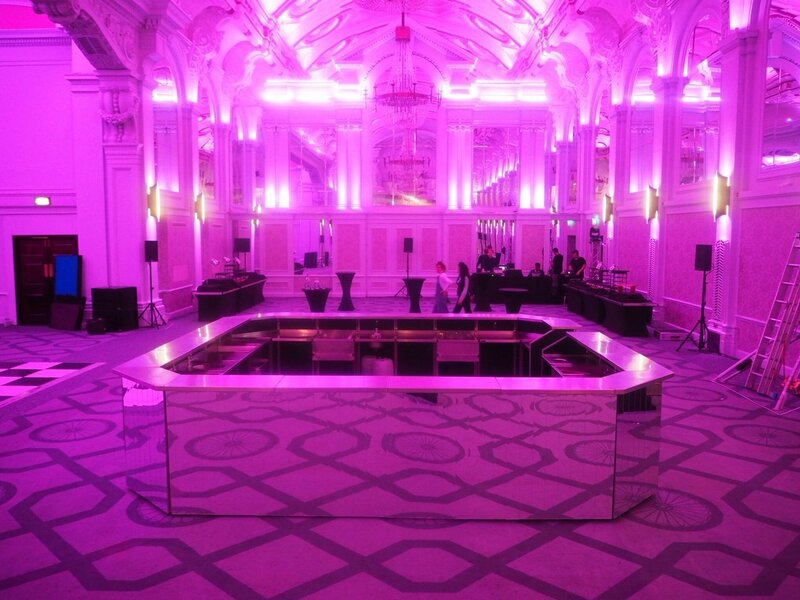 When we were presented with the venue for the event, the De Vere Grand Connaught Rooms, we immediately knew we would need an amazing mobile bar to fill this incredible space, our large mirrored island bar was the perfect fit. 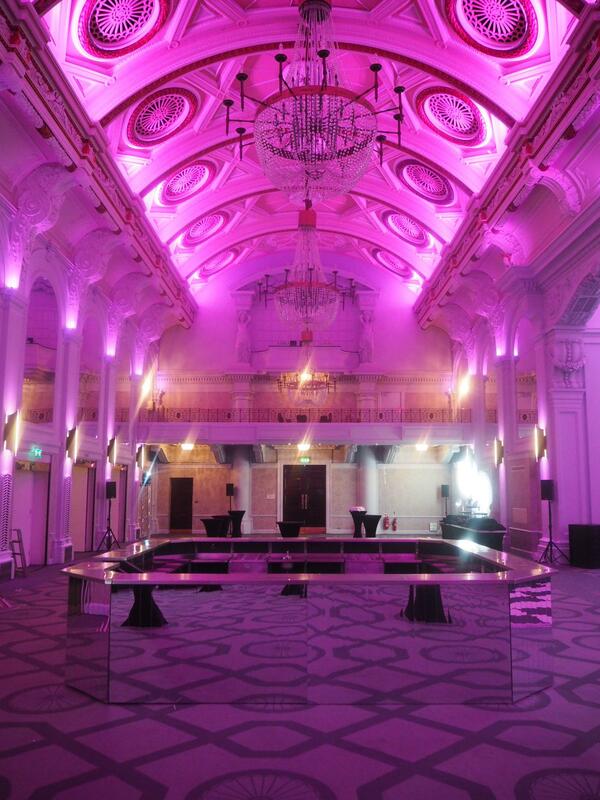 A huge space with an ornate and beautiful vaulted ceiling, the De Vere Grand Connaught Rooms make an excellent choice for a large corporate event, with grand chandeliers and an array of mood lighting. Once we saw the lighting in action, our large mirrored island bar was the obvious choice as it fits both the grandeur and style of the room and the mirrored glass reflects and envelops the incredible lighting and space. Standing at 4.8 meters in length (if arranged in a straight line) this is a large mobile bar, however due to the the design of our mobile bar system – we can in fact make almost any bar of any size as we hold a huge stock of mobile bar units. Each of these individual bar units simply slot together, which is great for getting large mobile bars or long mobile bars into a space with access limitations. Taking place in Covent Garden, London, this amazing mobile bar was hired as part of our dry bar hire package for a private corporate event, serving around 800 guests. Although the client opted for a dry bar hire package this time (just the mobile bar), the bars still come fitted with taps and sinks, ice wells and speed rails, to ensure you have all the equipment you need to run an effective event bar. Our mobile bars can be designed entirely to your specification, and as we talked about before, in any size or shape you need. The Classic Range makes use of real and tactile fascias such as our large mirrored island bar, or our craft wood mobile bar. The HD Range allows you to print any of your own graphics or images on to the fascia of the mobile bar with optional LED back-lighting. And finally our LED Range act as big blocks of colour lit by hundreds of LEDs, which can be tuned to any colour on the RGB spectrum – or event to consistently change colour if you prefer. You can have a play around with some of our most popular designs on the Ace Bar Configurator, our handy online mobile bar design tool. 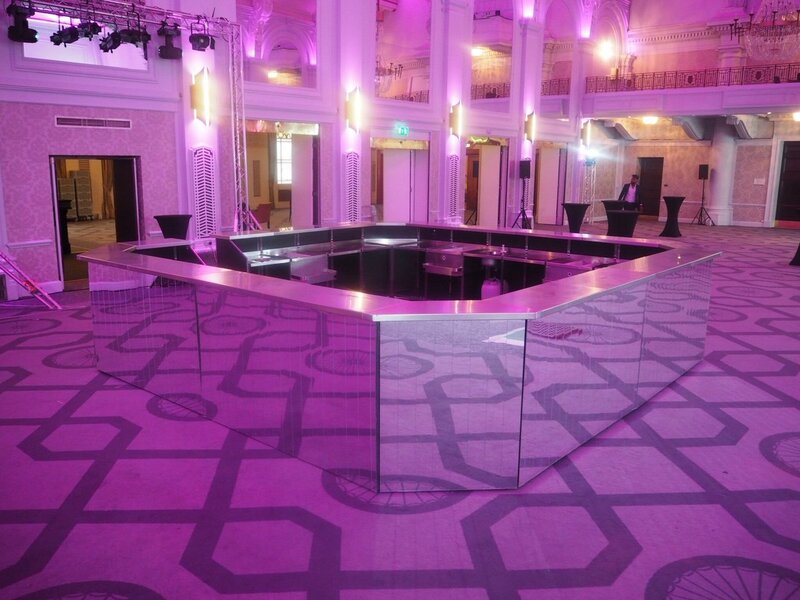 If you are interested in our large mirrored island bar, another large mobile bar, bartender hire, cocktail creations or anything else – then please do not hesitate to get in contact.